Last week I was celebrating the 4th of July for several days with family so I literally caught up yesterday with the friends that posted. 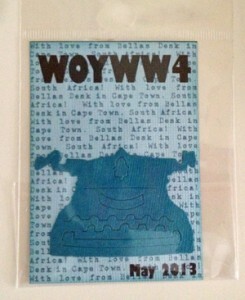 So when I say it seems like it was just yesterday that I was typing up my WOYWW, there is some truth to it. So here are some of the things I am working on this week. Let’s start at the left on my table. I am working on an interactive beach themed card using my Silhouette (which I am loving BTW). Underneath that is a cigar box I bought a while ago to alter. I bought some really beautiful paper from Heidi Swapp and even some brass legs to attach underneath. So stay tuned for when I actually begin work. I have had it on the shelf and thought perhaps putting it on my desk might be the nudge I need to make it happen (one can hope). My Jelly Beans are low but have no fear I have several more bags to replenish that I received from dear friends on my birthday. In the back you can see a card I scraplifted from Silhouette’s Blog. I liked it and I am even going to frame it like I saw on their site (no shame here). In front is a project I started for my husband but I need to print the tiny photos to go in it. The cute chalkboard hearts are actually attached to mini clips, I want to use them on a card. 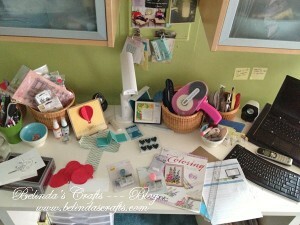 In the front of my desk is my recent crafty purchase. I got both Amy Tangerine and Dear Lizzy date stamps to use on Project Life. I bought some new Copic nibs because months ago, I damaged one. I also bought the latest and greatest Copic Coloring Guide 4. Super excited to work through it. I have learned a lot from each guide and look forward to this one. My dear friend Bella beautiful ATC. Recently, I received some mail from South Africa and I did my happy dance even before I opened it because I knew it was from Bella. She surprised me and mailed me an ATC even though I didn’t participate this year. Last time we swapped and she made a beautiful one with an elephant. Thank you Bella, your the best. Not sure what a Silhouette is, but it made a beautiful card/wall hanging. Lovely hearts and super handy date stamps. A Silhouette is an electronic die cutting machine. It connects to my computer and it will cut out shapes from paper, cloth and many more types of materials. 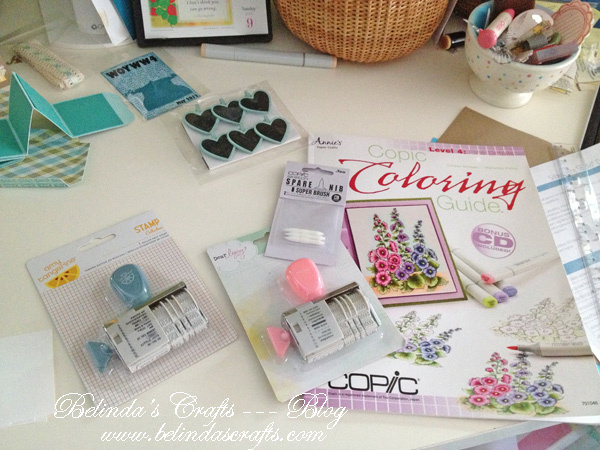 I recently bought mine and have only used it on my card projects and some scrapbooking thus far. The other joy of using the Silhouette is that you can print your design, then send it straight to the Silhouette to print out for you. You can make your own designs for it to cut at whatever size you choose, unlike machines like the cuttlebug etc where you are limited to the one size. I have made my own decoupage sheets, taken them into the Silhouette software to create the die cut. The Silhouette links with your existing printer to print your design together with the marks that it needs to set the cut in the right place. Any pre-designed designs from others can be set up in the same way. 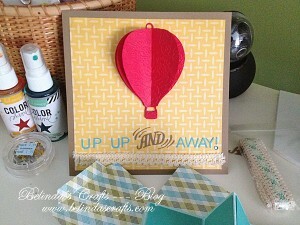 love the balloon card! glad you had a fun 4th july, and love your surprise ATC! Loved it Bella. 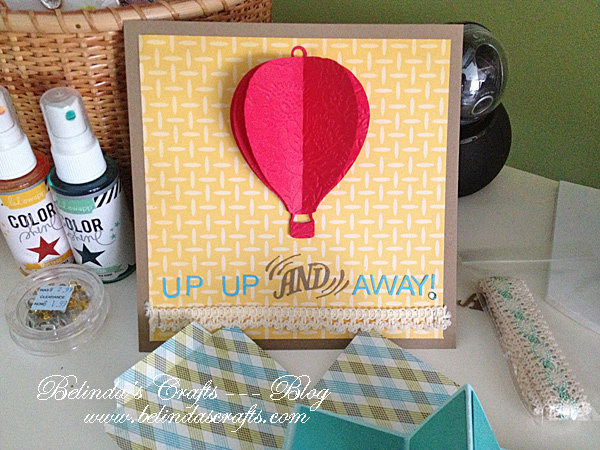 The balloon was originally designed to use as a mobile but I saw this example on a card and had to try it. Thanks so much for your sweet words regarding my cards that I do for Mo’s Digital Challenge. Wow you really touched my heart. Your card are amazing! WOW, Just stunning. I see you are a fan of the Cameo Silhouette. Well so am I-smiles. I rock that machine all time on every card. I just love it. Be Blessed.